I’ve had a few people mention to me this truck selling gyros in the Toys-R-Us parking lot in Fort Smith. My photographer even mentioned it to me. So yeah, I had to go check it out. 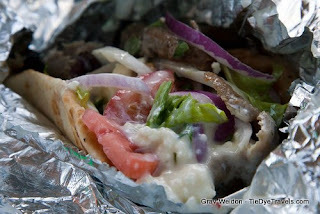 What I discovered was Paizi’s Gyros, an old favorite in a new place… an old favorite I usually enjoy only once a year. Usually in October. I recognized the trailer from the moment we drove up. The banners. The décor. All of it scrubbed clean and fresh, but still the exact same trailer I have seen year after year. Where? At the Arkansas State Fair, of course. 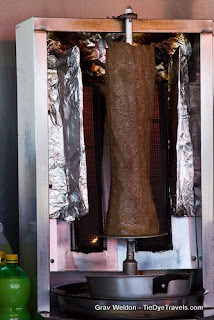 Paizi’s has been doing the Fair for quite a long time, with gourmet gyros of all sorts. But to see it here… seemed incongruous, somehow. No matter. When we pulled up there were easily half a dozen customers hanging around the trailer, some already consuming gyros wrapped in foil in both hands or picking bits of meat out with a fork. Of course I asked. And yes, they are the same Paizi’s from the Fair. Turns out, they park somewhere for the spring season (March through early June) then pick up and hit the festival circuit. They’ll travel from one festival to another through early September, then spend a week and a half at the Arkansas Oklahoma Fair in Fort Smith. The final stop of the year is the Arkansas State Fair… then, a quiet winter. So, how’s the food? I’ve enjoyed the Black Angus in Pita before, and the Rosemary Chicken is very nice. But it’s been a while. And there was hunger involved. So a combo was acquired — a gyro, fries and a drink for $9. The drink even came in a souvenir Arkansas State Fair cup. 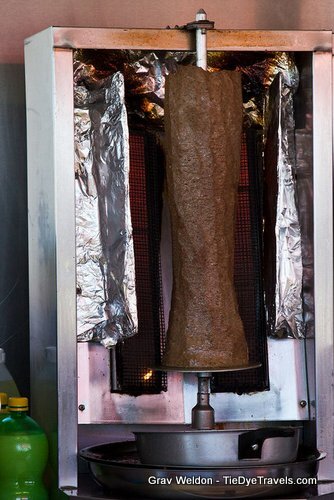 Paizi’s lamb gyro meat is what you might expect — the big cone of lamb-beef compressed meat rotisserie roasted and carved vertically. It’s served up on a nice fluffy pita and topped with a mixture of spring greens, both red and white onions, fresh tomato slices, a cucumber-garlic taziki sauce and… Feta cheese. The Feta gives the gyro a particularly different flavor — it’s in a sauce, very piquant and bright. 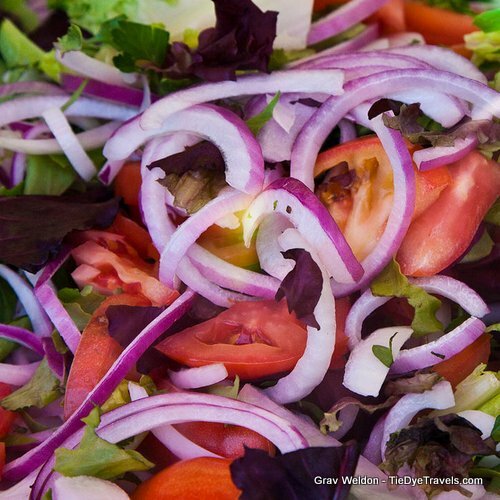 The combination is pleasing… but I have to say, you can’t eat this daintily. 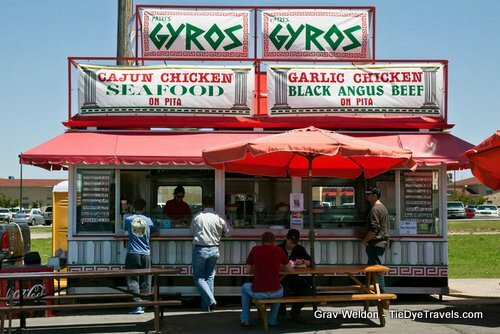 Yes, you can grab a fork from the table at the end of the trailer, but then you miss out on the cacophony of flavors inside that pita. Nope, best way is to get both hands around it, squish it a bit and bite in. No need to be surprised when sauce and meat juice drips down your chin. None at all. 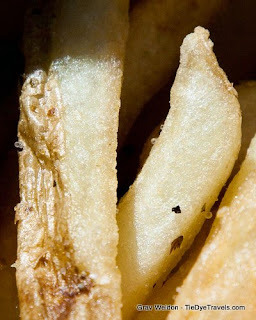 The surprise for me, though, were the fries. They were appealing, appetizing, and completely without need for ketchup. They were skin-on, fresh and fluffy inside, with a nice Greek seasoning about them. I was quite pleased with them. You could also choose chips with your gyro on the combo… but why? Why would you choose a pre-packaged bag of chips? Anyway, Paizi’s won’t be there forever… they’ll be picking up some time in June for a summer of gypsy-like wandering. So if you’re in Fort Smith and want a gyro fix, they’ll fix you up. 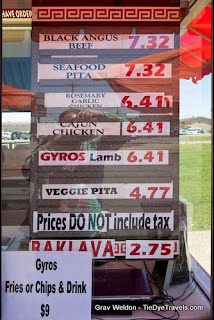 They have baklava, too. You’ll currently find Paizi’s in the Toys-R-Us parking lot on Rogers Avenue. No phone number — it’s a trailer, after all — but there is a Facebook fan page. UPDATE: Paizi's is now a brick-and-mortar establishment in Fort Smith. Check out the webpage here. Call (479) 434-5808 for more information or visit the restaurant at 4900 Rogers Avenue.